GOP policies have been a disaster in Kansas and its governor seems doomed. Could one other GOP tactic save the day? Out here the gravity of discontent pulls in only one direction: to the right, to the right, further to the right. Strip today's Kansans of their job security, and they head out to become registered Republicans. Push them off their land, and next thing you know they're protesting in front of abortion clinics. Squander their life savings on manicures for the CEO, and there's a good chance they'll join the John Birch Society. But ask them about the remedies their ancestors proposed (unions, antitrust, public ownership), and you might as well be referring to the days when knighthood was in flower. Appearing on Morning Joe on MSNBC in New York, Brownback was interviewed about the recent tax cuts he signed into law that will reduce individual rates and eliminate income taxes for the owners of 191,000 businesses. “On taxes, you need to get your overall rates down, and you need to get your social manipulation out of it, in my estimation, to create growth. We’ll see how it works. We’ll have a real live experiment,” Brownback said, “you’ll get a chance to see how this impacts a particular experimental area, and I think Kansas is going to do well,” he said. It is as though Jack Abramoff and Tom DeLay had been transplanted to Topeka and given a free hand to sculpt the state however they chose. You’ve got runaway incompetence in the state administration; heavy-handed partisanship, with conservative Republicans crushing moderate Republicans after the familiar pattern; corporate money—Koch Industries is based in Wichita—sloshing around like a vast underground aquifer. You’ve got privatization, deregulation, and an enthusiastic race to the bottom. (Gotta be more business-friendly than those people in Missouri!) You’ve got tax cuts so severe they’ve brought on fiscal catastrophe and thrown the state’s school system into crisis. You’ve got bullying by state legislators against organizations that criticize Brownback’s healthcare plans, and hints of pay-to-play corruption just under the surface. And, of course you’ve got credit downgrades as all this becomes known to the outside world. I think they (the mainstream media) want what’s happening in this state to fail that they’re shopping for a factual setting to back that up because it’s working...I think the left is just so desperate. They want this model to fail so bad that they can’t wait for it to and they just want to get me electorally before we get on through this and prove that this is working. Age. In Kansas, the turnout effect among registrants who were 18 years old in 2008 was 7.1 percentage points larger in size than the turnout effect among registrants between the ages of 44 and 53. ....Race or ethnicity. We estimate that turnout was reduced among African-American registrants by 3.7 percentage points more than among Whites in Kansas. ....Length of registration. In Kansas, the reduction in turnout for people registered to vote within 1 year prior to Election Day 2008 was 5.2 percentage points larger in size than for people registered to vote for 20 years or longer prior to Election Day 2008. Kobach disputed the findings, naturally. (The left, the media, the GAO --- they're all in it together.) 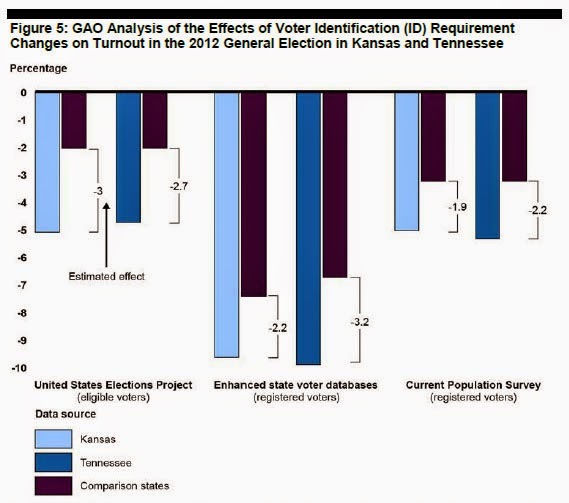 But the GAO said their methodology was "robust and valid" and reported that turnout declined between 08 and 12 by a larger amount in Kansas and Tennessee than any of the other states they studied – 1.9 to 2.2 and 2.2 to 3.2 percentage points, respectively. That is significant enough to make the difference in a close race. And this Governor's race is likely to be close. Who says GOP policies don't work? Sure their economics are a tragic failure and their social policies have become embarrassments. But this one's working like a charm. And it may be all they need.